Long, long ago, in a galaxy far, far away … American archaeology banished migration and diffusion as “anti-scientific non-explanations.” Then, sometime around 1990 in the U.S. Southwest, migration resurfaced in a session on Mesa Verde-Rio Grande at the Fourth Southwest Symposium, in CRM Salado projects in the Tonto Basin, and in the legal requirements of NAGPRA. * Turned out that migration really mattered. Now migration is mainstream. After two decades of renewed study, we find that migration was complicated, with ranges of variation across many axes – several of which are measurable. If migration could be usefully rehabilitated, what about its evil twin, diffusion? How do things, people, ideas, and institutions get from point A to point B? Surely that depends on what sort of things, people, ideas and institutions. And what about A and B? Adjacent? Half-a-continent apart? And it depends on …what else? We won’t begin to know until we ask. A recent issue of American Anthropologist reviewed “archaeology in 2012.” Jennifer Kahn highlighted “movement of people, ideas, and things across landscapes,” with a picture of a Polynesian voyaging canoe on the cover. She offered examples from around the world – but none from the Southwest. We’ve made amazing technical strides in sourcing pottery, obsidian, and even people. Here, however, I’m interested in the contexts and mechanisms of transmission: how and why diffusion happened and its impacts — in short, diffusion’s historical contexts. The relationship between our technical capabilities and the questions we ask is reciprocal: new questions may demand new techniques. Diffusion was dead, but now it’s back. Let’s re-animate that zombie and see what it has to say. This essay is a narrow critical history and narrower review of methodology: how historically-minded social sciences and – most specifically – archaeology handle cultural connections, focusing on the pre-Columbian New World both as a case-study and as an area of particular significance in Western intellectual history. I focus on what historian Peter Watson called “the Great Divide” between Old and New Worlds (Watson 2011), surely the grandest “natural experiment of history” – to borrow another book title, this from Jared Diamond (Diamond and Robinson 2011). Both Watson and Diamond see huge differences between Old and New Worlds, and indeed there were. Those perceived differences were grist for several mills: foundational texts of the Enlightenment, social evolutionary philosophy and Marxism, the ethical underpinnings of American nation-building – and we live today with the consequences of them all. I will argue that perceived differences in our topic – cultural connections – in Old and New Worlds may stem as much from our methods and assumptions, as from ancient realities. This section reviews globalization and its predecessor, diffusion, and then introduces the particular case of cultural connections as studied by American anthropological archaeology – a seemingly provincial matter with major implications for the global understanding of cultural connections before globalization. “Globalization” emerged as a field of study in the 1980s. As originally propounded, globalization was aggressively modern and industrial: European capitalism compounded with colonialism. With the rise of the World Wide Web, globalization became trans-national and, in a sense, post-colonial – although the West remains more networked than the East. Critical thinking about globalization and the world-wide web is fixed on the very-near-past, the present, and most of all the future. But, are globalization and cultural connections really new? Is globalization necessarily modern, industrial, and (initially) Euro-centric? A growing thread of scholarship looks back and looks broadly – for example, historians Robert McNeil and William H. McNeil’s (2003) The Human Web: A Bird’s-Eye View of Human History. Globalization had pre-modern provenance. Immanuel Wallerstein formulated the highly influential concept of a “world-system” with a pre-industrial European core and colonized peripheries. Gunder Frank pushed Wallerstein’s world-systems back deep into proto-history, positing a Eurasian world-system as early as Ur. Globalization, then, was not necessarily modern, nor industrial, nor European: pre-modern Asia and Africa were densely connected, too. Significantly, the New World enters these narratives only after Christopher Columbus blundered into the Caribbean. The New World comes into play only after Europe discovers it. A Victor Mair wryly noted: “One is tempted to regard it as a kind of Eurocentric religion, the central tenet of faith being that – until it was discovered by modern Europeans – no place on earth had meaningful contacts with any other distant place” (Mair 2006:12). Many globalization scholars reject pre-modern applications, protesting that modern technologies defined globalization. That claim underwrote exceptionalist intellectual strategies, declaring pre-modern history irrelevant to the study of globalization. Recently, however, an important globalization scholar, Nayan Chanda of the Yale Center for the Study of Globalization, has come to question that exceptionalism, in Bound Together: How Traders, Preachers, Adventurers and Warriors Shaped Globalization (Chanda 2007). Chanda starts the clock with the African exodus, humans leaving the mother continent to populate the world. Chanda follows those connections, with ellipses and lacuna, into the present and on to the future. While Chanda’s broad view may be a minority among globalization scholars, he shows that the limits of modernity are questioned not just by pre-modern advocates, but also mainstream globalization thinkers. A distinct historical sub-discipline focuses on pre-modern cultural connections: World History. World History is not simply collections or aggregations of regional or national histories; rather, World History’s goal is to examine cultural connections between and among the regions. World history of pre-modern times has focused on Eurasia and north Africa, showing definitively how inter-connected the culture of those land mass were, back into deep pre-history; e.g. Jerry Bentley’s (1993) seminal Old World Encounters: Cross-Cultural Contacts and Exchanges in Pre-Modern Times. World History makes it clear that long distance dynamics were always important and occasionally transformative in the histories of societies and nations throughout Eurasia and Africa. Importantly, World History corrects the perception that within the Old World, cultural connectivity was an exclusive or defining property of Europe. It is nearly impossible to think of a civilization in Asia, Africa, and Oceania which did not value and which was not shaped by long-distance connectivity. Diffusion was a major focus for early anthropology, a shibboleth of Victorian times, a quaint old term associated with “hyper-diffusion”of everything out of ancient Egypt; or with outré notions of ancient ocean voyagers, spreading improbable things around the world. Diffusion, today, is mostly absent from archaeology text books; when it appears, it’s usually a cautionary historical footnote. Diffusion, however, survived Victorian times, particularly in the remarkable work in the 1920s – 1950s of the Berkeley School of historical geography, led by Carl O. Sauer. And diffusion remained a constant interest – if not always a central theme – in Old World social sciences and history, particularly in England and Germany. V. Gordon Childe – probably the most significant mid-20th century archaeologist – published What Happened in History, a very influential book about diffusion of early civilizations from the Near East into western Europe. In America, A.L. Kroeber published an important essay on “Stimulus Diffusion” in American Anthropologist in 1940. “Stimulus Diffusion” marked an interest in the topic that carried through the historical social sciences – and particularly archaeology – through mid-century. The culmination of diffusion in American archaeology and ethnohistory came in two monumental tomes by Charles Di Peso and James A. Ford. Di Peso’s (1974) eight-volume Casas Grandes: A Fallen Trading Center of the Gran Chihimeca argued that much of the prehistory of the USA’s Southwest (Mesa Verde, Chaco Canyon, etc.) was the result of active manipulation and diffusion from Mesoamerica. Ford’s (1969) monumental A Comparison of the Formative Cultures of the Americas: Diffusion or the Psychic Unity of Mankind, published by the Smithsonian Institution, did much the same for the USA’s Southeast (Cahokia, Moundville, etc.) Indeed, Ford went further: after an exhaustive analysis of traits, timings and distributions, Ford concluded that trans-Pacific contacts ignited the Formative, which thereafter diffused among and between the American continents. Diffusion was summarily rejected by American archaeology in the 1970s, as aggressively scientific “New Archaeology” rejected diffusion along with almost everything else inherited from pre-War scholarship. Marvin Harris, a key theoretical figure, noted that “as soon as we admit, as the archaeology of the New World now compels, that independent invention has occurred on a massive scale, diffusion is not only superfluous, but the very incarnation of antiscience” (Harris 1968:378). Contemporary American anthropological archaeology – as well as ethnohistory and history –are understandably suspicious of cultural connections and hostile to long-distance claims, such as Lost Tribes or Phoenicians wandering around the New World. Diffusion in the methodological repertoire in the first half of the 20th century was allowed only within academically defined regions of the New World. No trans-oceanic diffusion! The only long-distance cultural connections to gain acceptance were historically the first and then the (nearly) last: the Pleistocene peopling the New World by land and perhaps by sea; and, much nearer to Columbus, medieval Norse intrusions into Greenland and eastern Canada. Diffusion redivivus? In the Old World, diffusion remained and remains a strong thread in archaeology and history, with considerable thought being given to what “diffusion” actually means and how it actually worked. A major European study of Bronze Age diffusion won the Society for American Archaeology’s Book of the Year award in 2007, signaling stirrings among American archaeologists and historians of renewed interest in diffusion. Given American anthropological archaeology’s and ethnohistory’s track record on diffusion, those interests are understandably tentative and exploratory. We have not reached the critical mass of intellectual interest that would spark sustained engagement with methods and theory in diffusion. There may be significant culturally- and historically-founded differences between Old and New Worlds in our assumptions about cultural connections and diffusion. It is possible that Old World and New World were profoundly different. That belief underwrites Jared Diamond’s (1997) Guns, Germs and Steel, and Peter Watson’s (2011) Great Divide. And, if true, that difference would be fundamentally interesting and important to understanding cultural connections throughout the world and throughout history and prehistory – before modern globalization. But I argue that the perceived differences are, at least in part, the result of different methodologies – history in the Old World, anthropological archaeology in the New World. Those methodological differences must be resolved before any meaningful conclusions are reached. World History tells us that Old World cultures connected early and often. History and social science, in the Old World, must at least acknowledge those larger contexts. In the New World – and particularly in the prehistory of the USA, the province of American anthropological archaeology – we tenaciously assert that pre-colonial Native societies were strongly local, and cultural connections were rare and – mostly – inconsequential. We allow carefully regulated trade and exchange, and not much of that. Indeed, the editors of a recent volume on trade and exchange lament that “archaeological interest in trade and exchange … has declined in recent decades” (Agbe-Davies and Bauer 2010:13) as archaeological attention turned away from global or meta-narratives to local stories. I offer here a brief example of the possible importance of diffusion in North America, focusing on two major Native American sites – Chaco and Cahokia – in what are now the United States, and the high civilizations of Mesoamerica, in Mexico. Chaco was a Pueblo Indian regional center, in what is now northwestern New Mexico. Cahokia, on the Mississippi River across from modern St Louis, was Chaco’s exact contemporary. Cahokia was the largest Native city north of Mexico, and far larger than most European cities of its time. “Mesoamerica” was a vast and complex region, encompassing many states and civilization. I use the term here for those parts of Mesoamerica engaged or likely engaged respectively with Chaco in the US Southwest, and Cahokia in the Mississippi valley and the Southeast. States, empires, and civilizations flourished and fell in Mesoamerica for almost two thousand years before Chaco and Cahokia. We assume that societies in the regions which later became Chaco and Mississippian were aware of those developments to the south. Of Chaco, Cahokia and Mesoamerica, Chaco (A.D. 900-1125) was clearly the junior partner, in part because the corn agriculture that fueled Cahokia and Mesoamerica was risky and uncertain in Southwestern deserts. Chaco – a dry canyon in northwestern New Mexico – was central to a region with a few tens of thousands of people, who were from time to time buffeted by drought. Yet, in this unpromising region, Chaco developed as a small city of perhaps 3,000 people, marked by a half-dozen masonry “Great Houses” – structures that took local traditions of domestic architecture and scaled them up to palatial dimensions. Noble families lived in the Great Houses. Substantial quantities of corn, pottery, building materials, and other goods flowed into Chaco to support the nobles and the social undertakings centered in the city. Noble families distinguished themselves from commoners both by their Great Houses and – more central to our theme here — by the conspicuous display of powerful objects, foodstuffs, and animals obtained from distant Mesoamerica: tropical birds, cacao (chocolate), metal artifacts, and many other things. These objects confirmed the nobles’ status, a common tactic in secondary states around the edges of major civilizations. Turquoise, controlled by Chaco and highly valued in Mesoamerica, paid for potent political symbols. Chaco flourished for a time, before being laid low by drought. Chaco was the first and last political system in what would become the Pueblo Indian world. There were no precursors, and no successors. Chaco became a memory for modern Pueblo people, who never attempted (nor wanted) another capital city. Chaco’s story, of course, is more complicated and interesting. Cahokia (A.D. 900-1250) had a parallel career, but on a much larger scale and with greater historical impact. Unlike Chaco, Cahokia inherited long traditions of monumental architecture and the use of exotic materials and art-styles, from earlier civilizations that rose and fell in the eastern United States. The city of Cahokia rose rapidly, drawing in populations until the city became larger than most Mesoamerican (and European) cities of its time. The city centered on a vast public plaza, surrounded by “mounds” including the largest pyramid north of Mexico: Monk’s Mound, larger in area than the pyramids of Giza. Cahokia’s immediate reach went at least as far as 300 miles, as shown by Cahokia “colonies.” Undeniable cultural connections ranged from the edge of the Great Plains on the west to the Atlantic on the east. Nobles of such power that they could properly be called kings ruled or attempted to rule this vast area, bigger than many Mesoamerican states and hugely larger than Chaco. We can very safely assume that the lords of Cahokia were fully aware of Mesoamerica. Cahokia’s historical impact was much greater than Chaco’s, which may have approached the mythic status of the early Mesoamerican centers – like Tula, emulated for centuries after their endings. Cahokia itself faded by 1200, and by 1300 the great city was essentially empty. But secondary Mississippian centers – smaller versions of Cahokia – popped up all over the eastern USA, surviving right up to European colonization. Cahokia looked very much like a Mesoamerican city built without the stone masonry: pyramids around a plaza. Chaco had the stone masonry, but looked nothing like a Mesoamerican town: its Great Houses were clearly part of the Pueblo tradition of building, and nothing like them can be seen in Mesoamerica. These qualities were not superficial: simplified to architectural plans and elevations, there can be no question which – Chaco or Cahokia – was more similar to a Mesoamerican city. Yet Chaco had large quantities of Mesoamerican objects, while Cahokia (to date) has produced few if any Mesoamerican materials. Why? Peter Peregrine and I hypothesized that Cahokia, building on a long history of monumentality and exotic exchange, did not need foreign props to legitimate power (Peregrine and Lekson 2012). The lords of Cahokia employed and manipulated symbols of power which had long precursors in the memories of societies which came under Cahokia’s sway. Indeed, Cahokia’s portable symbols of power may have moved into Mexico, enhancing the prestige of Mesoamerican nobles rather than the reverse. In contrast, Chaco, a starter-kit kingdom on the edge of empire, needed anything it could use to legitimate and bolster its fledgling nobility – always precarious because of the harsh Chacoan environment. With turquoise and Mesoamerican prestige goods, Chaco nobles could “buy” legitimacy. Cultural contacts, diagnosed archaeologically, would have Chaco on the receiving end of Mesoamerican diffusion, and Cahokia innocent of any Mesoamerican taint. Yet the scenario presented here, if correct, has Chaco actively seeking selected element of Mesoamerican civilizations, while Cahokia can legitimately be considered part of that Mesoamerican world. Thus, diffusion was purposeful and directed. This was not simple trade and exchange; nor was it a cult spread from convert to convert. To be sure, diffusion was wrapped up in trade and ritual. But at heart, cultural connections between Chaco and Mesoamerica, and between Cahokia and Mesoamerica were political, and reflected the differing socio-political histories of Chaco and Cahokia. Peregrine and I argue that in the New World – and particularly in North America – cultural connections should be assumed rather than treated as extraordinary claims, requiring extraordinary proof. Then, by comparative analyses such as that just presented of Chaco and Cahokia, we can recognize patterns and consequences of diffusion which might otherwise go unnoticed or, worse still, be ignored because our methods are unequal to the task. As with migration, we must develop new methods (not just new techniques!) to make diffusion a fruitful field. And, as with migration, diffusion make sense only in historical context. It all comes back to history. We can know ancient, non-documentary history, but to do so we need new methods and new epistemologies. We must set aside childish things like “scientific certainty” and become comfortable with history’s ambiguities. History can and should be rigorous, systematic and evidential — but history is not science. We can attack the problem on two fronts, the Old World and the New World. They are unequal: the Old World is well documented – leading to World History and the conclusion that cultural connections were normal; the New World lacks documents – perhaps leading to the conclusion that cultural connections were exceptional (indeed, that is the core question). How to find common denominators – an analytical language – which will correct for differing methodologies which currently compromises Old-New World comparisons? I will suggest one research program for the Old World, and a series of research programs for the New World. For the Old World: strip the record of its documentary advantages. Consider the distributions of artifacts, architecture and landscape from known, documented cultural connections – bereft of the documents. Would the archaeological record, alone, suggest or support the cultural connections we know from documents? I propose a series of such studies of pre-industrial societies across Europe, Asia and Africa, specifically aimed at creating comparability between Old and New World situations. The utility of such studies for New World scholars are obvious. Old World scholars might wonder: what’s in it for them? I submit that the “experiment” of New versus Old World is of such transcendent importance – it helped launch the Enlightenment and altered the trajectory of world history – that the global question should be of interest to Old World scholars. The New World: Lacking documents and many of the transportation technologies of the Old Word, the New World is the junior partner. It requires more work. First and foremost, we must recognize that the New World in fact had history and that understanding that history is fundamental to everything else archaeological. And recognize that history is not science. Our current methods – steeped in scientism – are inadequate for writing history. That does NOT mean that history is some sort of free-for-all of “just so stories.” We already have methods – under-developed – for writing archaeological pre-history. I summarize three tools which could help us write history: (1) triangulation – understanding historical trajectories in their own terms; (2) commensuration: relentless comparisons; and (3) models to develop and evaluate counter-factuals and alternative readings. We must recognize that the New World really had history – the same sort of history we take for granted in the Old World. This seems obvious, but I submit that American anthropological archaeology has labored for over a century to effectively deny such history. Absent archaeological input, World History ignores the New World before Columbus because historians need documents, and most of the New World lacked that class of evidence. Only with the latest empires, and in a few other favored contexts, are documents available – and then subject to far more uncertainty in historical interpretation than familiar Old World. Archaeological history will lack names and personalities that populate Old World (and later New World) history. It will necessarily essentialize social forces and events. The New World won’t offer many kings and battles, it can offer mostly only polities and wars: not Napoleon lost at Waterloo, but French expansion ended. Rousseau and Hegel dismissed Native America as essentially history-less – conclusions inadvertently convenient for colonialism. Societies without written records were consigned to Anthropology, not History. The colonial situation obtained, of course, around the margins of the Old World and the histories of those societies were written from the documented side of the colonial encounter, Eurocentric or Arabic or Moghul. At least there was a hint of history; but the colonial notion of history-less peoples encompassed almost the entirety of the New World. Archaeologists know that the New World had a deep and rich history or, rather, histories beyond number. But – as explained above – American anthropological archaeology has no idea how to write something like history for the societies we study. I have proposed elsewhere that to write that history, American anthropological archaeology must cease to insist on scientific certainty and proof, and begin to think historically. It can be done, with results far less precise but surely more accurate than the anthropological alternative. As an interpretive discipline, History will never give us the single true narrative; but historians deal with substantive diversity quite well, and Anthropology – and especially archaeology – must learn to cope with substantive uncertainty as well. Eric Wolf (1982) wrote eloquently about Europe and the People Without History. Social sciences must learn to write the history of societies without documents, to write history for peoples heretofore denied history. An example, from North America: Chaco in the Southwest and Cahokia in the Mississippi River valley were major regional centers, each capitals of large regions in the AD 11th and 12th centuries. Both Chaco and Cahokia have been the subject of dozens – perhaps hundreds – of monographs, articles, theses and term-papers, variations on the theme of “evolution of sociopolitical complexity” or “development of complexity” framed locally: the evolution of complexity at Chaco, or at Cahokia. Framing the question locally overlooks the fact that “socio-political complexity” had already “evolved” well over two millennia before Chaco and Cahokia, 1500 miles to the south in Mesoamerica. We can be confident that the rulers of Chaco and Cahokia were cognizant of developments far to the south. They knew their historical context, even if we chose to ignore it. Complexity did not “evolve” at Chaco and Cahokia; it diffused from Mesoamerica to those later, northern centers. The first of three tools: triangulation. Ethnohistory shows how different New World societies and institutions were from Old World. New World history cannot be written to Old World standards – that leads to anthropological typologies and social evolution. Categories based on Old World history would negate the grand experiment by biasing the explanandum – yet we must have commensurate terms and languages, elsewise we have no experiment at all. So: how to write a history of the New World? If we accept that the New World had a dynamic history, then ethnohistory takes us back only a few generations. What came before we must piece together on its own terms. 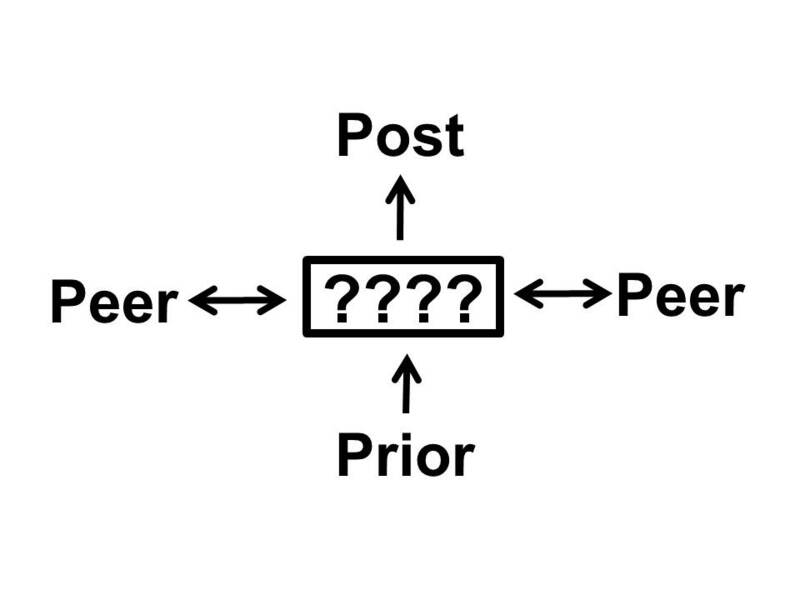 I have no magic bullet for how that can be done, but I am developing strategies I call “tri-angulation”: looking at historical events from a dense mesh of viewpoints – prior, post, peer events (Figure 1). If event X is our focus, what do we know about what came prior, before X? what happened post, after X? What peer events were contemporarily with X? An example, from Chaco: The regional center at Chaco seemed to arise de novo, without precedent in the Southwest. And it appeared to end just as abruptly, with no issue. With more data, we know now that the first fledging steps towards Chaco’s class structure and regional supremacy happened not at Chaco Canyon, but a century earlier and 100 miles to the north – Chaco’s “prior.” Construction ceased at Chaco around 1125; this date has been conventionally used as signaling Chaco’s fall. But we now know that Chaco did not “fall” or collapse, but rather, at about 1090, deliberately shifted north to build a new successor capital at the mis-named Aztec Ruins. Aztec Ruins – Chaco’s “post” – continued Chaco’s regional role in the Southwest. And what of Chaco’s “peers,” it’s contemporaries? A remarkable civilization known as Hohokam rose and fell in the deserts 250 miles south of Chaco: rose as the earliest stirrings of Chacoan political structure emerged, and Hohokam fell as Chaco itself rose and expanded. The timing was probably not coincidental. By “triangulating” Chaco — prior, post and peer events – we have a much richer historical account of that event. The second tool: commensuration. Comparison, comparison, comparison — relentless comparisons. If we disallow the categories of anthropology and social evolution, we lose our conventions and vocabularies for describing the explanandum. But we still have comparison, archaeology’s most robust logic. We may not be able to determine the nature of an event simply by studying it, measuring it, analyzing it. But we can reliable determine that event A is bigger than event B, or longer, or shorter, or denser, or less organized, etc. Some dimensions are mathematical and therefore universal; others will be rooted in Eurocentric experiences and concepts. As long as we acknowledge and track those biases, I’d say all’s fair in apples and oranges – and in oranges and potatoes. By building up a matrix of comparisons, we add dynamics to the mesh of triangulations. An example, again from Chaco and Cahokia in North America. Chaco embraced Mesoamerican political and ideological symbolism, to legitimize its centrality and importance. Cahokia, on the other hand, was enormously larger than Chaco (and many Mesoamerican cities), and needed no Mesoamerican embellishments to cement its status. Comparisons of their scale demonstrate this: Cahokia was perhaps ten times larger than Chaco in population. Cahokia’s region was enormously larger than Chaco’s: Cahokia’s region encompassed perhaps ten eastern States, any one of which is larger than Chaco’s region at the most optimistic. Cahokia’s control of labor, building huge pyramids, dwarfs Chaco’s monuments. In almost every dimension we can compare, Cahokia was larger than Chaco. Yet Chaco had many exotic Mesoamerican elements, while Cahokia had few or none. We can be certain that Chaco and Cahokia were fully aware of Mesoamerica; but their different engagements led Peter Peregrine and I to conclude Chaco needed Mesoamerica while Cahokia did not (Peregrine and Lekson 2012). And, finally, the third tool(s): models and counter-factuals. In the Southwest, computer models or simulations of ancient societies have reached a high degree of development, particularly in the American Southwest. Success is measured by how close the models parallel our ideas about what happened in the ancient Southwest – that is, the events as we perceive them. An example: as noted above, Chaco ended with a shift of the capital to Aztec Ruins followed a century later by the total depopulation of the region. Tens of thousands of people out-migrated, presumably in response to well-documented climatic deterioration. The most sophisticated models of demography in Chaco’s region, however, show that the region – despite climatic deterioration – could have supported up to half of the original population. That is, all of the ancient people did not have to leave. This model – a counter-factual – suggests that the out-migration was as much a political as an economic event. Most models are agent-based and bottom-up; and therefore dependent on how we believe that ancient peoples behaved – that is, their human nature. Homo economicus? Homo horribilis? Those assumptions make all the difference in how models play out, suggesting a role for counter-factuals – historical what-ifs. What if we recalibrate our models on the assumption that people were aggressive, or aggrandizing, or altruistic? What if we impose top-down assumptions – anathema in agent-based models and much American anthropological archaeological thinking – how would the New World look? I submit that many New World large-scale archaeological and ethnohistorical patterns and distributions, currently euphemized as “horizons” or “styles” or “culture areas” would look rather like Old World oikoumene, trading spheres, economies, and even empires. New World cultural connections might well look more like Old World culture connections, and assumptions about human nature we have inherited from the Age of Discovery and the Enlightenment might well require recalibration. *Migration never really vanished in Arizona, thanks to Emil Haury, Lex Lindsay, and Jeff Reid; but interest was muted during the heyday of New Archaeology. 1993 Old World Encounters: Cross-cultural Exchanges in Pre-Modern Times. New York: Oxford University Press. 2007 Bound Together: How Traders, Preachers, Adventurers, and Warriors Shaped Globalization. New Haven: Yale University Press. 1997 Rise And Demise: Comparing World Systems. Boulder: Westview Press. 2008 What is Global History? Cambridge: Polity Press. 2006 Pathfinders: A Global History of Exploration. New York: W.W. Norton. 1996 The World System: Five Hundred Years or Five Thousand? London: Routledge. 1988 Ulysses’ Sail: An Ethnographic Odyssey of Power, Knowledge and Geographical Distance. Princeton: Princeton University Press. 2007 The World System and the Earth System: Global Socioenvironmental Change and Sustainability Since the Neolithic. Walnut Creek: Left Coast Press. 2012 Transnationalism in Ancient and Medieval Societies: The Role of Cross-Border Trade and Travel. Jefferson NC: McFarland & Co.
2006 Contact and Exchange in the Ancient World. Honolulu: University of Hawaii Press. 2003 The Human Web: A Bird’s-Eye View of World History. New York: W.W. Norton. 2012 The North American Oikoumene. In Oxford Handbook of North American Archaeology, edited by Timothy R. Pauketat. Oxford University Press, New York. 1998. Culture contact structure and process. In Studies in culture contact: interaction, culture change, and archaeology. James G. Cusick, ed. Pp. 102–125. Center for Archaeological Investigations Occasional Paper no. 25. Carbondale: Center for Archaeological Investigations, Southern Illinois University. 2011 Deep History: The Architecture of Past and Present. Berkeley: University of California Press. In archaeology, context is everything. Or, so I’ve been told. Two recent essays on Chaco take issue with interpretations which underwrite my posts here: Stephen Plog’s (2011) “Ritual and Cosmology in the Chaco Era” and Barbara Mills’ (2012) “The Archaeology of the Greater Southwest.” Besides not much liking my interpretations, these essays – by two of the Southwest’s leading archaeologists – are united by a firm belief in the importance of ritual, particularly over the political interpretations I favor. “Montezuma’s Castle” and “Cliff Palace” began as cowboy enthusiasms, fanciful names for dramatic ruins. Today those names are merely tourist bait. The Park Service greets you with denials and corrections: it’s NOT a castle, it’s NOT a palace. Ignorance excuses the excesses of early archaeology. We know better now. Ruins are more fitly named for a nearby creek or peak or, better still, a Native name. In fact, most sites today are simply numbered: LA 49 or 5MT5.